2. When not restricted by the challenge, custom card types and mechanics are allowed, provided that they are explained in the same post as the entry. 3. After roughly one week, the person who posted the challenge judges the entries, declaring a winner and one or two runners up. 4. The winner of a challenge posts the next challenge. When another player gains a Treasure card costing at least $3, you may reveal this from your hand to have them exchange the gained card for a Treasure costing up to $3 less. During your turn, you may discard this to reveal your hand with no Action cards. If you do, +2 cards. Edit: Changed from "On your turn" to "During your turn" - I don't believe a tiny wording change merits a spoiler tag and the old version but correct me if I'm wrong. On your turn, you may discard this to reveal your hand with no Action cards. If you do, +2 cards. What would be the timing for this? Start of turn, or any time during your turn? Whetstone - Treasure Reaction, $4 cost. Worth $3 if your deck is empty, otherwise $1. When you play an Attack on your turn, you may play this from your hand. Anytime during your turn that you have no action cards in hand. It should probably say "During your turn" instead of "On your turn" but oh well. Edit: It was bugging me so I changed it in the op. When another player plays an attack, you may first set this aside from your hand. If you do, then at the start of your next turn, +1 card and return this to your hand. So it's a Laboratory that can redraw itself, without needing an action to use, and once you don't need to draw any more cards it doubles as a Silver? It's only a lab if you don't have any other actions in hand. In strictly BM or games where you only buy cantrips, it's a lab equivalent that can also be used as silver, yes. Now that Violet CLM's pointed out the fact that Investment is a Lab variant, it definitely seems overpowered to me. The spoiler thing is mainly there so that discussion of the card still makes sense after changes are made. Take your -1$ token. Reveal cards from your deck until you reveal a card costing $3 or more. Discard that card and put the rest into your hand. When another player trashes a card, you may set this aside from your hand, to gain a copy of the trashed card. If you do, put this back in your hand at the start of your next turn. 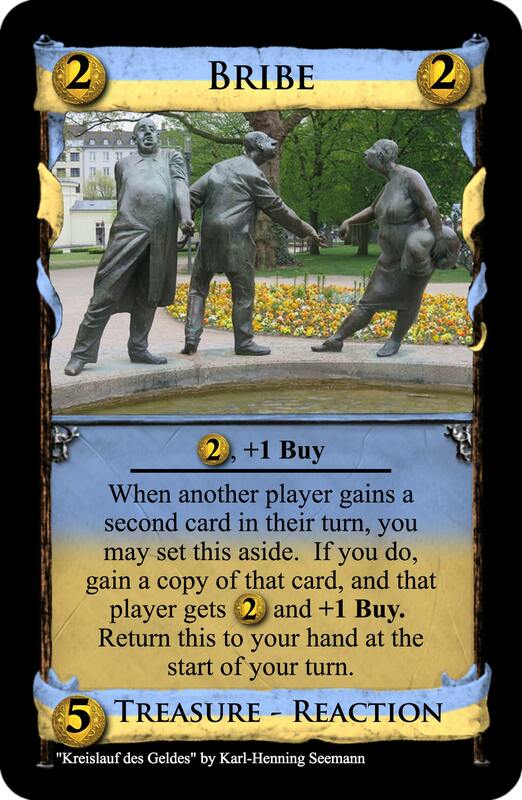 When another player gains a second card in their turn, you may set this aside. If you do, gain a copy of that card, and that player gets $2 and +1 Buy. Return this to your hand at the start of your turn. I like the idea of this card, but I think it can't be a reaction, since there's nothing it's reacting to. You could say "Directly after you finish playing an Action card, you may reveal this..."
Directly after you finish playing an Action card, you may reveal this, setting it aside. If you do, +2 cards and discard this at the start of your cleanup phase. That's not a bad suggestion, but I will point out that there are no specific rules on reactions - each one gets its own FAQ. Neither the trigger nor the FAQ for Investment seem like they would be too confusing. The other drawback to your suggestion is that it limits functionality quite a bit. I was hoping to design a treasure that enables less reliable engines. Using your clause, if Investment is drawn in a hand of all non-actions it's just silver - that's not necessarily bad, but my idea is to give those hands a second chance to kickstart the engine. The card you create based on this does seem incredibly overpowered though, since you removed the bit about needing to show a hand with no action cards. Your version is a $4 super lab that is just silver if you can't play an action first. Wouldn't At the start of your turn, you may reveal this from your hand for +1 Action, be a simpler wording? Unless you want them to not stack. 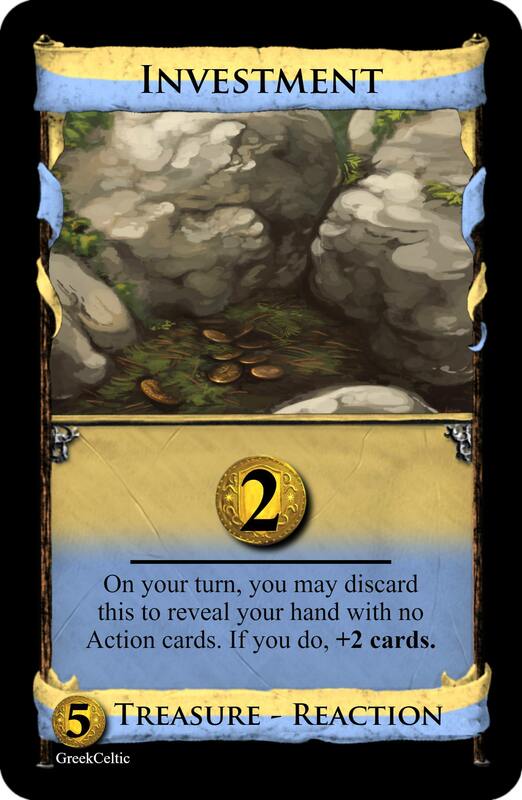 This card is in my opinion the most interesting one, Treasures for an engine (kind of the inverse of Encampment). It is similar to Cookielord's Realm Tax. No, then you could reveal the same one several times, claiming it was a different one. By the rules of Dominion, nothing stops you from revealing a Reaction card multiple times to the same event, since there's no way for other players to tell if it's the same copy or what. Yeah, I could definitely see sense in having it cost $5. I like this concept a lot. Obviously it's a great defense from certain attacks and it's amazing with trash-for benefit. It's just silver on boards with no trashing, but that's not super common. If it had the ability to trash stuff, that seems like it would make it perfect, but I don't know if that would make it too strong. -$1 per Treasure card you have in play (including that one). Darn, I knew Quicksilver's top seemed familiar. 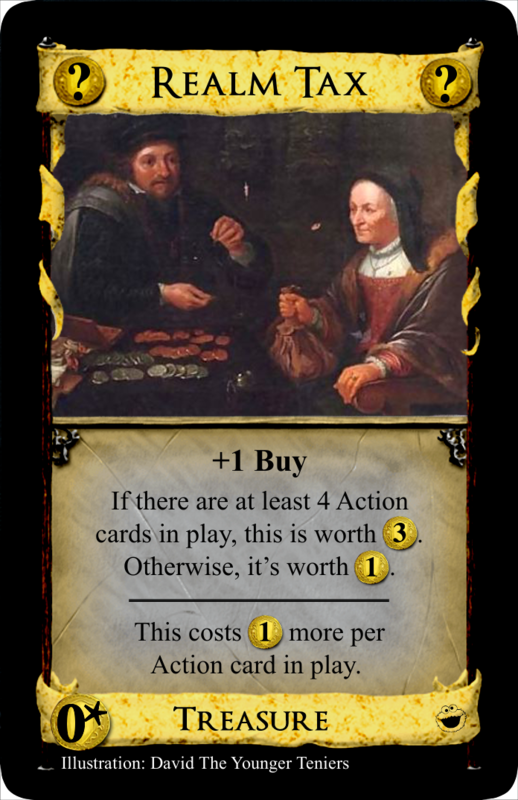 I wanted it to be more interesting than a fixed amount, but the main catch was starting with a free Action if you have one in hand at the start of your turn. Maybe you should mention this thing about Reaction cards in the OP? It seems to be an oft-unknown rule.